From the mirror in our hotel room my howled face looks at me. Our night had started wonderfully – later I was overcome by the great sadness. At first it was just a few tears, but later I cried snot and water – and Monika and Michelle were also anything but in a good mood. Our irrevocably last day together has begun. Michelle wants to take a flight to the west in the late afternoon. To Frankfurt or Paris or better directly to London. Her time became increasingly scarce. Monika and I want to go further east by car. Across Pakistan and through the north of India we want to go to Dhaka, the capital of Bangladesh, which was only founded two years ago. Breakfast is cancelled, addresses and last caresses are exchanged, Michelle is looking for some souvenirs for her family. In the afternoon we take her to the airport, promise us mutual visits in London and Berlin. Later, we see her a little depressed as she lines up at the counter of ARIANA, the Afghan airline. The next day we drive on via Jalalabad up to Khyber Pass. About 220 kilometres. It takes us only a little more than five hours. The road is okay, leads through fertile valleys and over bone-dry mountain passes. The last 50 kilometres are steep uphill. Dozens of narrow serpentines screw up the mountain slopes. It is pleasantly cool but the many trucks pollute the air with their black smoking diesel exhaust fumes. Twice we overtake camel caravans, which are heading east on the unpaved side strip of the road. About five kilometres before reaching the pass and the border crossing to Pakistan we see a really extraordinary road sign. The road divides here. 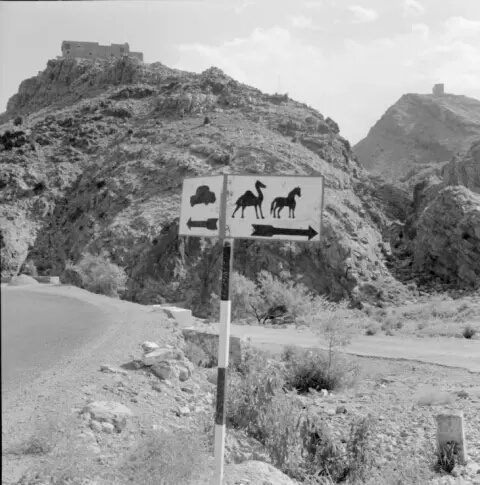 Motor vehicles have to drive straight on while camels on their way to Pakistan have to take the road that branches off to the right. This is the land of the Pashtoons. Officially it is under the control of Afghanistan in the west and Pakistan in the east – but in fact even the British, who were the colonial rulers here until 1947, “didn’t get a foot on the ground” in the area around the Khyber Pass. Rarely have I experienced such rapid border clearance outside Europe. After a good hour we are in Pakistan – and thus in left-hand traffic. We drive on via Peshawar to Rawalpindi to the new capital Islamabad, are held for a long time by a life-threatening flood and reach the Indian border. We are not allowed to go to Bangladesh – instead we travel via Patna to Darjeeling and then to Kathmandu, the capital of Nepal. But all this is another story that has nothing to do with Afghanistan. I never heard from Michelle again. The next chapter of my Afghanistan Diary will be published on 30 April 2019. It’s title will be “September 1996 – Koranic School in Pakistan”. New chapters will follow fortnightly – more than 60 will be published in total.